Shahid afridi is an all time favorite cricketer of people across globe. He started playing cricket at very young age of 11-12 years. He played domestic cricket from some club of Karachi, his first international cricket was at age of 16. This boy, wanted to become fast bowler but his aggressive bating made him a huge hit on world charts. So he started his career with praise and loads of likes. Along with bating, he started bowling and is now recognized a world class spinner. On his credit are many world records. 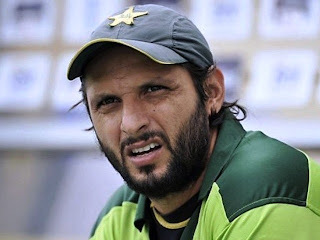 Shahid afridi is not only liked because of his outstanding performance, but one major cause of his likeness was, in his early career, his good looks. Girls used to attend all those cricket matches in which afridi played. His female fan following is not limited to Pakistan only, but his fans are found across the globe. In fact many times camera showed posters proposing shahid afridi. He completed his studies along with his cricket career. He is few of those cricketers of Pakistan who speak English without hesitation and fluently. Shahid afridi then changed the course of his life, got married had daughters and then joined jamate- islami along with many other prominent cricketers of that time and grew his beard, and presented himself to the world as a practicing muslim. He was also made captain of Pakistan team and he served as captain during cricket world cup 2011. In his captaincy, Pakistan cricket team performed outstandingly and qualified from semi finals. He is the fastest century scorer in ODI. The uniqueness of his fastest century is that he scored these 100 runs against very experienced bowlers of sri lanka and this was his second international game. He made 100 only on 37 balls which have never been broken by any one again. He hit 4 boundaries and 11 sixes to achieve this world record. Critics still consider his inning as the best ever inning played by any bats man. More over this century was his first ever hundred played. He is a great hitter. You will not find any innings he played without boundaries and sixes. He has the world record of highest sixer hitter which is still on his credit. Shahid afridi also made fastest 50 of his time. It was on 18 balls and remained a record for long. He is on number 8 in world ranking of bowlers who got 5 wickets 8 times i.e. 8 times he bowled in 8 matches and got 5 wickets. He is third leading wicket taker among Pakistani bowlers. He is the 4th leading spinner with highest wickets on his credit. He is the 3rd in the row that has most man of the match awards on his credit. He scored most number of sixes in limited over matches. He is the only bowler who led his team and has best figures as bowler in 2011 world cup.